This is a wonderful little dish that I came up with during my Texan sojourn, all those years ago. For those who have just tuned in – I spent six months living in Texas and, during that time, cooked many of my meals in a little 1 quart (1.5 litre) slow cooker I bought from the Walgreens next to my hotel. I became so attached to this little device that I wanted to bring it back to Australia with me, but voltage differences meant that wouldn’t be a practical thing to do. So, I was quite elated to discover the same size device for sale at Target when I got back. They aren’t any more (as far as I know), but you can find them in the appliance section at Woolworths for $20. Which is all by the by. This is a dish that costs next to nothing to make. This was very handy when the exchange rate dropped to USD 0.45 for every AUD 1 and I was suddenly very, very poor. Ahem. A slow cooker this size will serve three comfortably, more if you have a larger slow cooker and fill it. We worked out that the 1 litre size dish cost about $1.50 total to make. This isn’t so much a recipe as instructions for assembly. All you’ll need for this dish. 600 ml of stock (any flavour). The dried mushrooms are completely optional. I like to use them because they add texture and fill the kitchen with an amazing fragrance. I buy the dried shitake mushrooms from the supermarket and break them into small pieces. The mushrooms cost very little and keep for ages in an air tight container. 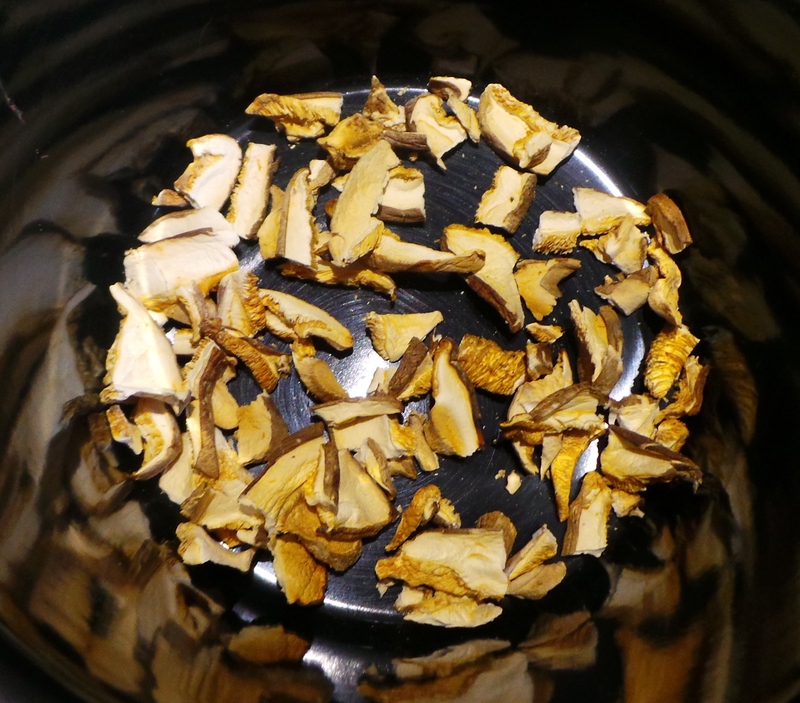 Break up the dried mushrooms and place a single layer on the bottom of your pot. If you find the Asian mushrooms too strong tasting, then feel free to use any others you may find. Also, if you have family members who object to the texture of mushrooms, try grinding the dried ones in a blender, mortar and pestle, or coffee grinder and just using the resulting powder. 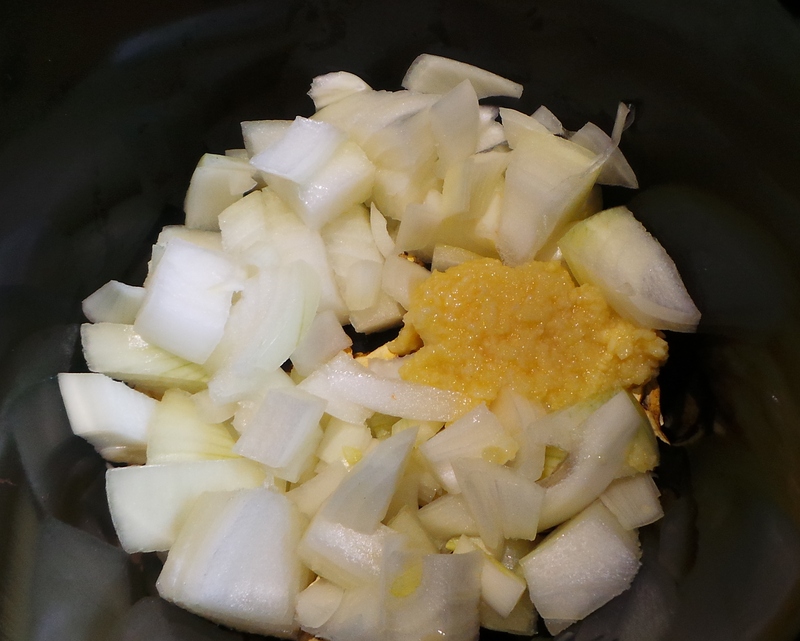 Follow this with a layer of diced onions and a spoonful of your jarred garlic. 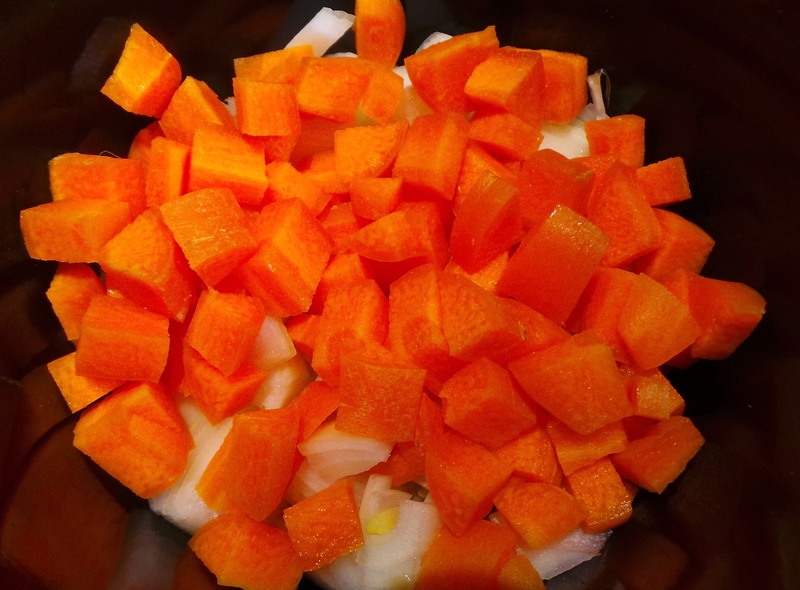 Then add a layer of diced carrots. Add a chopped up carrot. Follow with a stalk of celery. 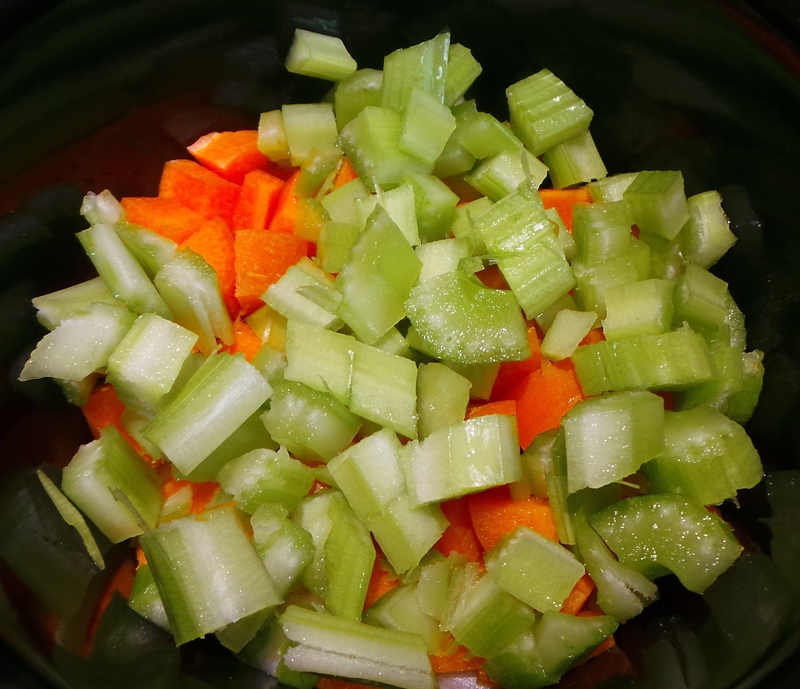 Diced celery completes your aromatics. Time to add your dried lentils. 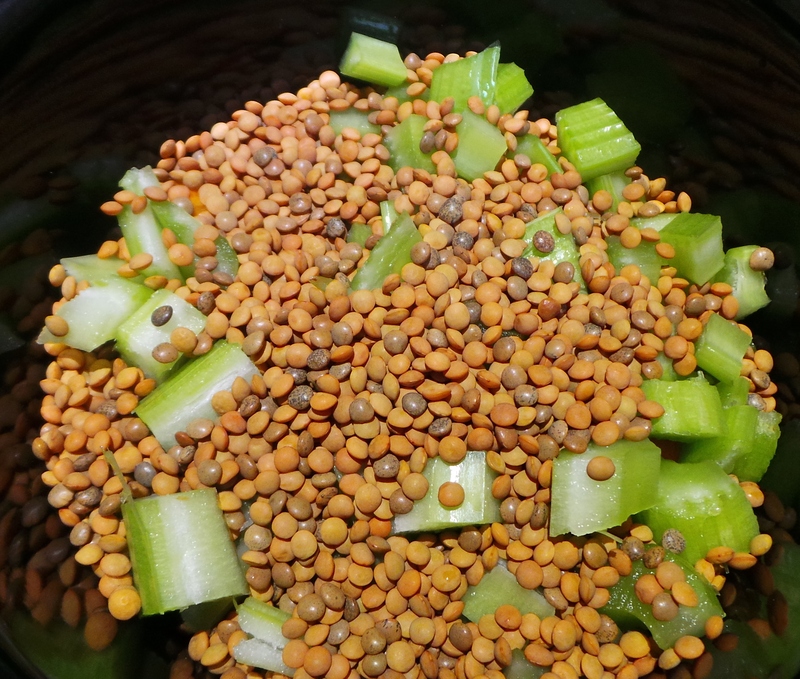 You can use a handful of ordinary brown or green lentils, or tiny little french Puy lentils, or these beautiful lentils from the Wimmera that I bought at a local Farmers’ Market. 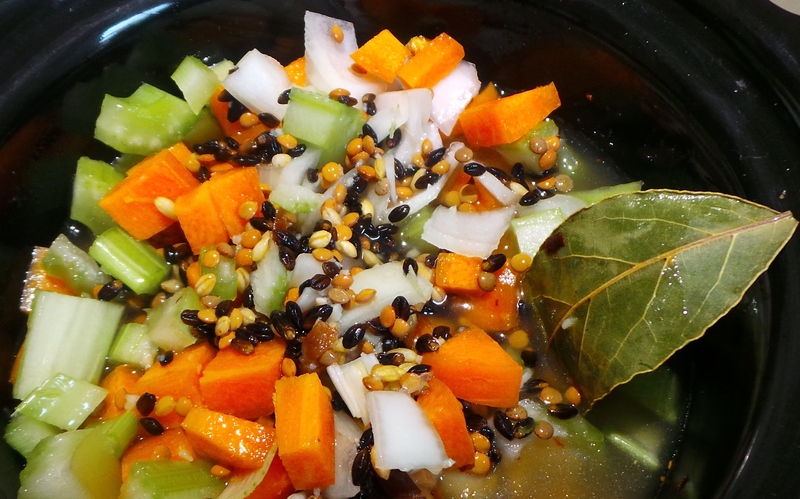 Add some perfectly lovely lentils. Now add a handful of barley. 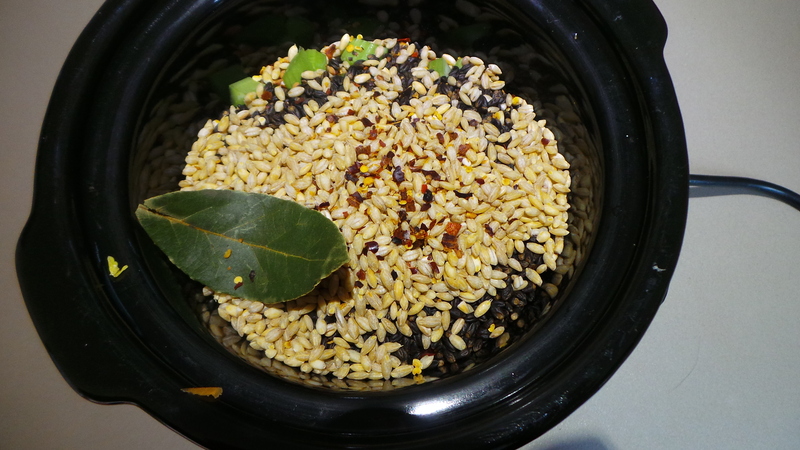 I had some black barley that I bought at the same Farmers’ market a while back, so I mixed that in with my regular pearled barley. Add a Bay leaf about now, if you have one. I like to add a few chilli flakes about now, but you don’t have to. This is the time to heat your stock if you have some already made, or to make it up if you are using a stock cube or bouillon. 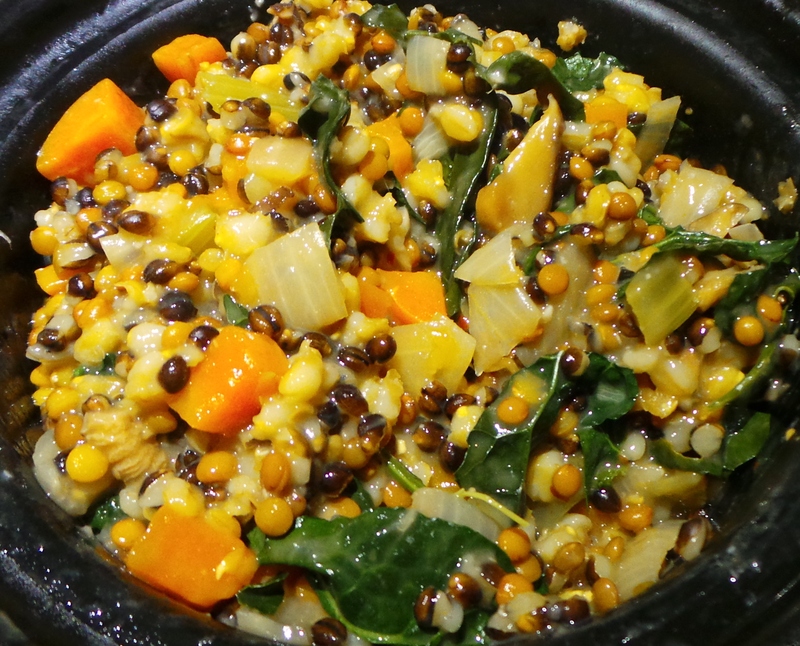 You can cook from cold if you are wanting the dish to take longer to cook – despite being in the slow cooker, this will only take an hour or two to be ready. It can be chicken stock (which is what I had), vegetable, beef, fish…whatever. Even plain water will do, although you may wish to add salt in that case. Make sure it covers the contents of your pot, add water if necessary. Stir and cover. Set to low. 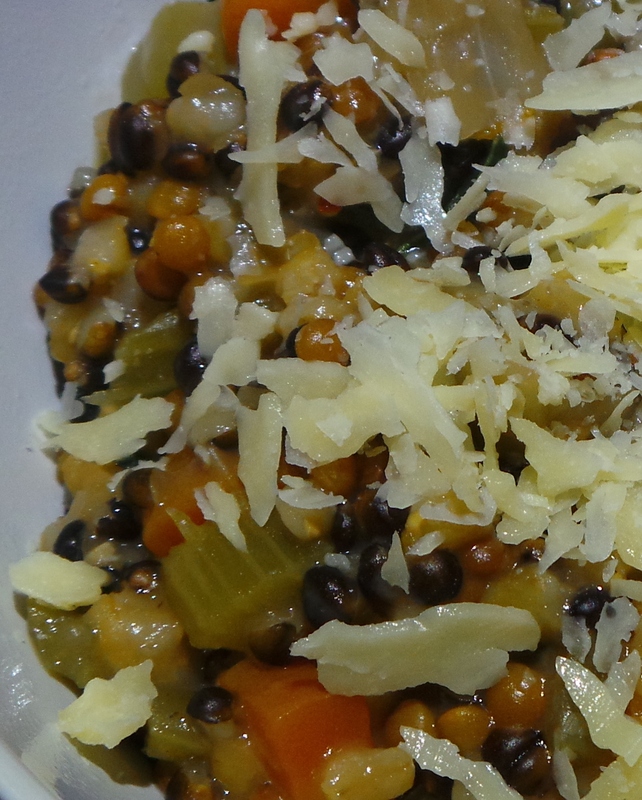 When the lentils are tender and the barley is cooked to your satisfaction, serve it up. I had been given a handful of Tuscan Kale (Black Cabbage or Cavolo Nero), so I shredded that and stirred it through about 10 mins before I served it up. I just put it in a bowl topped with some shaved parmesan. It’s very filling so don’t overdo the portion sizes. 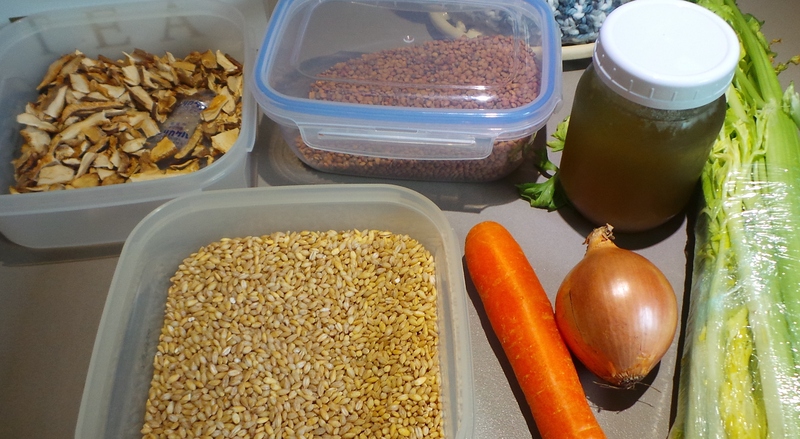 Things to remember: The barley will absorb the liquid and plump up like rice does. So don’t fill the pot to the brim with dry ingredients before adding your stock. Tears will result. And overflowing. And a right royal mess. 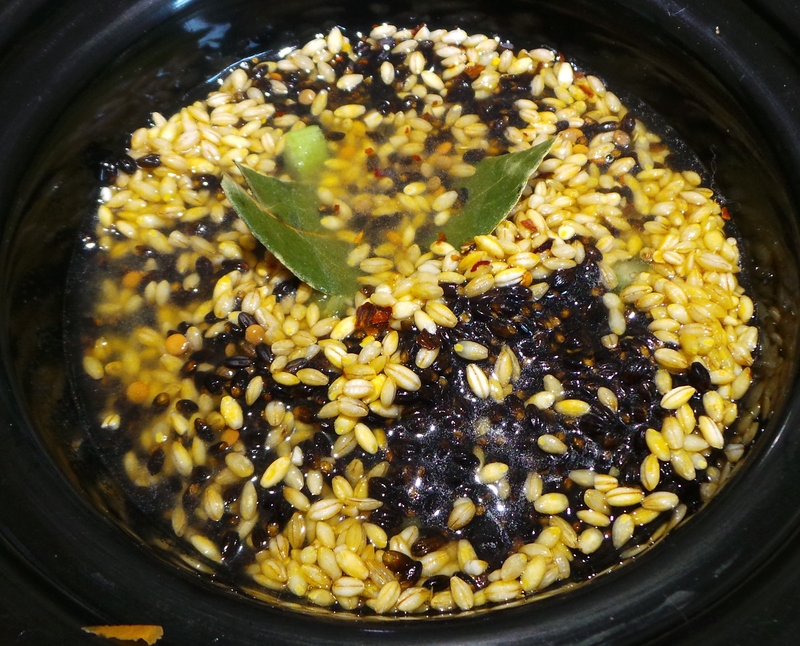 The barley will also cause the mixture to thicken. Stir it a few times after an hour or so, to prevent sticking. 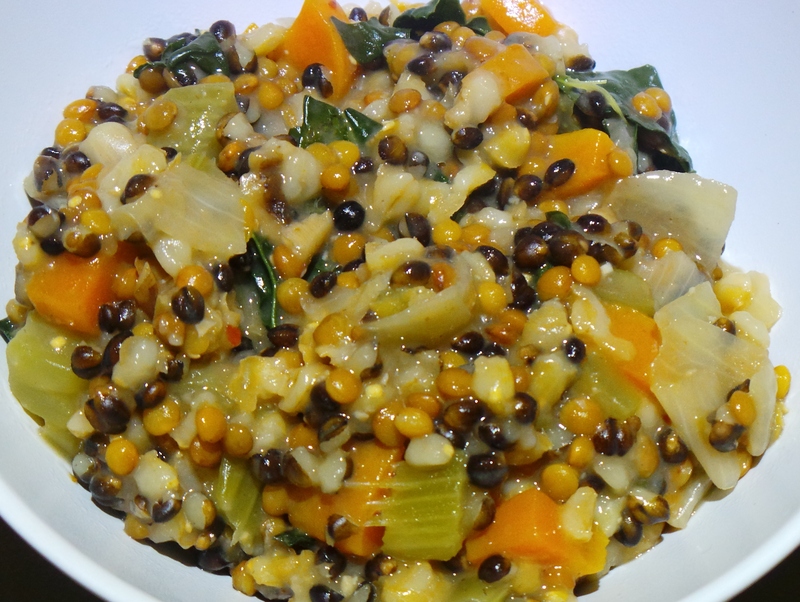 If you are making this for a coeliac, then use different forms of rice and perhaps millet instead of barley. If you are making this for people who are “allergic” to being vegetarian (and we all know those people, don’t we? ), then feel free to add some cubes of speck into the mix at the beginning or some shredded cooked chicken just before serving.